Yet while it might be true that nearly all of the great players are Southern, the division of labor in American golf is that nearly all of the great courses are Northern. In the latest Golf Digest ranking for instance, out of the top twenty courses only three—Augusta National, which is #1, Seminole in Florida, and Kiaweh in South Carolina—are in the South. New York (home to Winged Foot and Shinnecock, among others) and Pennsylvania (home to Merion and Oakmont) had the most courses in the top twenty; other Northern states included Michigan, Illinois, and Ohio. If it were access to great courses that made great golfers, in other words—a thesis that would appear to have a greater affinity with the notion that “culture,” rather than “nature,” was what produced great golfers—then we’d expect the PGA Tour to be dominated by Northerners. 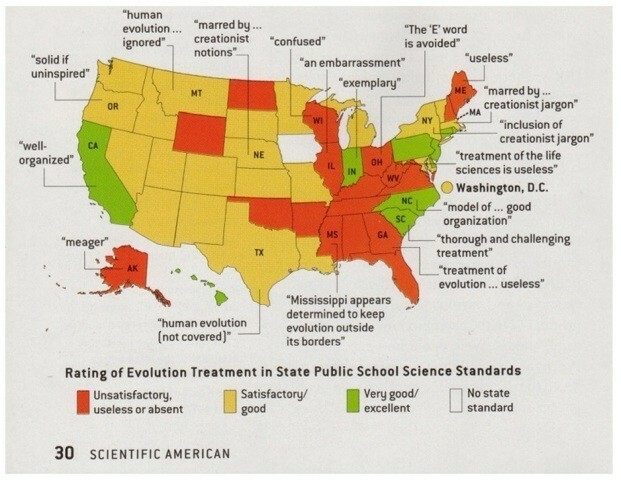 I realize that the map may be dated now, but still—although with some exceptions—the map generally shows that evolutionary biology is at least a controversial idea in the states of the former Confederacy, while Union states like Connecticut, New Jersey, and Pennsylvania are ranked by Professor Lerner as “Very good/excellent” in the matter of teaching Darwinian biology. In other words, it might be said that the states that are producing the best golfers are both the ones with the best weather and—perhaps paradoxically—a belief that nature has little to do with anything. Yet, as Professor Fish’s remarks above demonstrate, it’s the “radical” humanities professors of the nation’s top universities that are the foremost proponents of the notion that “culture” trumps “nature”—a fact that the cleverest creationists have not led slide. An article entitled “The Postmodern Sin of Intelligent Design Creationism” in a 2010 issue of Science and Education, for instance, lays out how “Intelligent Design Creationists” “try to advance their premodern view by adopting (if only tactically) a radical postmodern perspective.” In one of their tracts (Darwinism and the Divine: Evolutionary Thought and Natural Theology), Alister McGrath argues not only “that it cannot be maintained that Darwin’s theory caused the ‘abandonment of natural theology,’” and also approvingly cites Fish: “Stanley Fish has rightly argued that the notion of ‘evidence’ is often tautologically determined by … interpretive assumptions.” So there really is a sense in which the the deepest part of the Bible Belt fully agrees with the most radical scholars at Berkeley and other top schools.